Randy Compton is a passionate lifelong reader who became a teacher primarily because he likes to talk with people about what he has read. "The classroom is a natural forum for me to share my enthusiasm about what I read and to bounce ideas off others. I love to hear my students articulate their insights as I share my perspectives with them. The relationship between a teacher and student should enrich both. God has blessed me over the years with some deeply curious students with keen minds who have helped me shape my thinking, even while I helped them shape theirs." 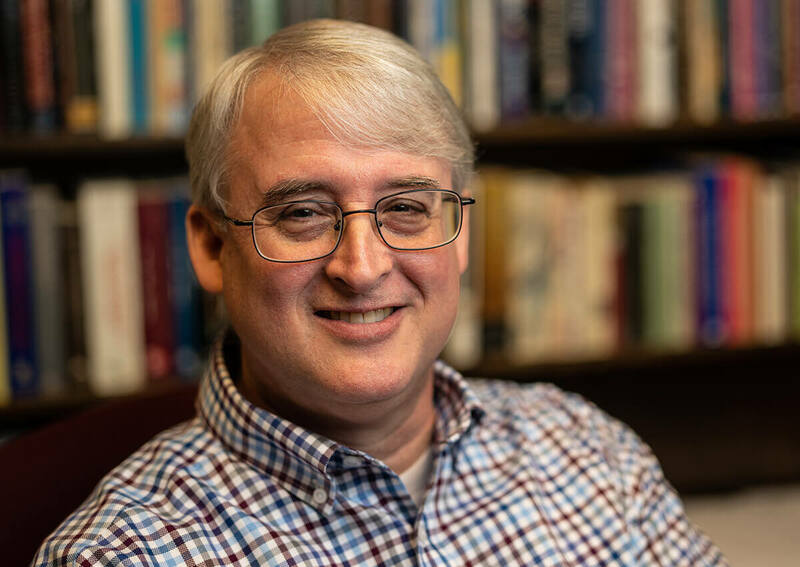 Randy's primary scholarly interest is in American Literature, but he has also grown increasingly interested in the relationship between theology and literature. He also likes writing and reading poetry. Randy serves as the faculty sponsor for the English Honor Society, Sigma Tau Delta (Alpha Eta Mu chapter). Randy was raised in Paris, Texas, but has lived in a variety of places while pursuing his education and career. Randy and his wife Mary have four children with ages ranging from 15 to 17. The family moved to Longview in 2007 from Cleveland, Tennessee, where Randy taught at Lee University. When he is not teaching, Randy loves spending time with his family, back-yard grilling, reading, browsing used book stores, collecting books, fishing, hiking and gardening. Dissertation:"Richard Wilbur and the Poetry of Apocalyptic Interstices"
Thesis: "'Haunted by the Good': Goodness, Beauty, and Spirit in Richard Wilbur's Poetry"
Destroying the Agrarian Myth in the Lone Star State: Land, Character, and Fate in George Session Perry's Hold Autumn in Your Hand. Conference of College Teachers of English; Lubbock, Texas March 2014. Conference of College Teachers of English; Ft. Worth, Texas March 2012. "'A Place for their Habitation': Space and Character in Middle Earth." C.S. Lewis and Inklings Society Conference; Tulsa, Oklahoma April 2011. Lost in the Trees: Cities in Tolkien"
National C.S. Lewis and Inklings Society Conference; Oklahoma City, Oklahoma April 2010. "Locating Good and Evil in the Landscapes of J.R.R. Tolkien"
Conference of the College English Association, Austin, Texas, March, 2009. "Troubled Good: Richard Wilbur and the Peaceable Kingdom"
South Central Conference on Christianity and Literature, Longview, Texas, February, 2008. "Memory, Language, and Doubt in Robert Penn Warren's Poetry"
Tennessee Philological Association, Chattanooga, Tennessee, February, 2007. "Dr. Calvin and Mr. Hyde: The Unifying Force of Total Depravity in The Strange Case of Dr Jekyll and Mr. Hyde." Conference of the College English Association, San Antonio, Texas, March, 2006. "Just Wondering," "Common Tongue," "The Epiphany of Elephants"
Poems read during evening session at Tennessee Mountain Writers Conference, Oak Ridge, Tennessee, April, 2004. "Richard Wilbur and the Poetry of Ugliness"
Southeastern Conference on Christianity and Literature, Macon, Georgia, April, 2003. "'Nothing Except Itself'": Reading the Movement of Light in the Poetry of Wallace Stevens." Tennessee Philological Association, Murfreesboro, Tennessee, February, 2001. "Knowledge and Perception in `Thirteen Ways of Looking at a Blackbird.'" Annual Conference on Language and Literature, University of North Texas, Denton, Texas, April 1990. "Envelope," "Ambitions" Tic Toc Anthology, Kind of a Hurricane Press, 2014. "Sermon Notes" The 5-2: Crime Poetry Weekly, April 2014. "Monster Minds" St. Katherine Review Fall 2012. "Interglacial" The Furnace Review, 2011. "Meditation in the Texas Hill Country," "Lost Prerogative," "Felling Bois D'Arc" Southwestern American Literature 2010. "Subterranean Music" and "Looking for Fossils in the Sulphur River" Triggerfish Critical Review, 2010.